At canal milepost 22, the second major dam on the C&O Canal provides the embankment to form the Seneca Slackwater, a well-used recreation area. The dam was built to supply water for the canal from the Seneca area to Dam No. 1 at Little Falls. Only rubble is left today, but the Potomac still backs up, forming the Seneca lake. The dam is connected to Inlet Lock No. 2, which supplies the canal with water from this point 17 miles downriver to Lock 5 (inside the District of Columbia). Canoe round trip. An excellent canoe expedition begins at Violette's Lock below Seneca Creek and proceeds across the Potomac above the old dam. Then, enter the Patowmack Canal (one of George Washington's projects), and navigate the old canal. Evidence of the early stonework is still visible. Several tight turns and rocky sections make this run one for experienced canoeists only. 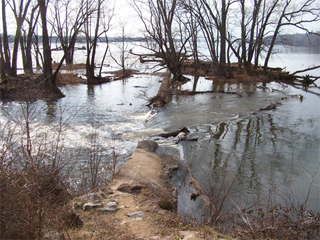 Once you exit the canal, you can return across the Potomac by picking your way through the islands below the dam. Return to Violette's Lock by way of the C&O Canal.